We study both experimentally and theoretically power and spectral characteristics of two types of Raman fiber lasers (RFLs) fully made with highly nonlinear photonic crystal fibers (HNL-PCFs). The first laser cavity is free from wavelength-selective mirrors, yielding a grating-free RFL which simply oscillates within a Fabry–Perot cavity formed by weak broadband Fresnel reflections from the fiber ends. In the second laser, Bragg grating mirrors have been written inside the core of the PCF and we demonstrate the oscillation of a Bragg-grating-based RFL fully made with a PCF. Power characteristics of both lasers are analyzed from simple models dealing with powers of optical waves which are assumed to be coupled through the only stimulated Raman scattering inside the laser cavity. 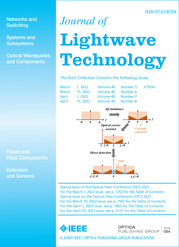 Optical power spectra of both lasers are described and compared with optical power spectra of RFLs made with conventional fibers.